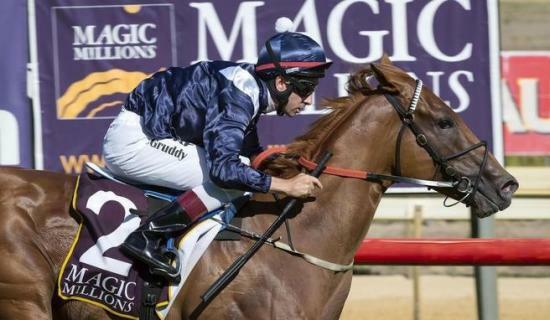 Powerful chestnut The River took the first step towards a rich double for trainer Trevor Andrews when he won the $250,000 Magic Millions WA 2YO Classic (1200m) at Pinjarra on Sunday. Andrews said the Magnus gelding, who was ridden by Shaun McGruddy, would be set for the $500,000 Karrakatta Plate (1200m) at Ascot on April 2. “He cost a syndicate $115,000 at last season’s Perth yearling sale and now looks a bargain,” Andrews said. Andrews has set a Magic Millions WA 2YO Classic record by training four winners since the race was launched in 1999. He had previously won with Ravinia (2006), Time To Climb (2010) and Lucky Street (2015). Lucky Street became the first horse to go on from a Magic Millions WA victory and also win the Karrakatta. The River, starting a $2.90 favourite, raced behind the leaders yesterday. He went on to win by a length from Stored Energy ($14.50), with The Celt ($5.80) four lengths back in third. Andrews’ second runner Trademark ($5.80) was unplaced after being caught wide. The River gave McGruddy, 34, his fourth winner at yesterday’s meeting. Andrews said he was interested in The River’s half-brother, a colt by Your Song, who will be JUoffered at the Perth Yearling Sale which begins next Monday. “I reckon the colt will sell for a high price,” Andrews said.